Last month I visited the historic Gangi in Sicily, a 14th-century hamlet voted “Most Beautiful Village in Italy” this year. I was there to scout out undervalued real estate—and you can’t get more affordable than what Gangi offers. I’d heard that Gangi was pretty special—besides being home to an incredible real estate opportunity, it’s a hidden gem whose beauty and historic significance has been overlooked by all but the savviest vacationers. Though it has modern amenities, journeying there feels like stepping back in time. I came from Sicily’s capital city, Palermo. (It and its international airport are just 90 minutes away.) The route requires a drive through a massive national park. 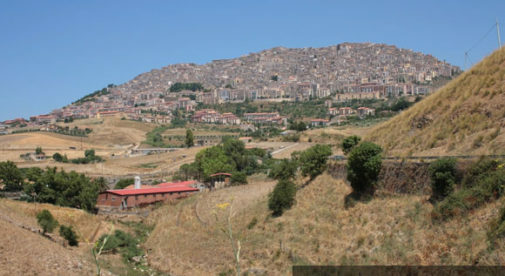 (Gangi nestles in between three of Sicily’s dramatic national parks.) I couldn’t believe the view that awaited me as I exited the park. Out of the corner of my vision, I could see a town high atop a hill, looking majestically down on me. It’s close to what it would have looked like in medieval times. Southern Europe’s hill towns were fortresses once—their locations chosen to offer protection for their gold and riches and to serve as a lookout over their domain. That means they offer amazing views. In Gangi’s case, you can see all the way to Mount Etna on a clear day. Look in the opposite direction and you have majestic views of Italian countryside. The village itself—home to a friendly and close-knit population of 7,000—is breathtaking, too. Tightly packed cobblestone streets lead to open town squares and 18 churches, some lavishly decorated. There was a lot of money in this village once. The merchants, bishops, and generals of old built luxurious homes to match their status, grand villas that dot the most desirable perches. Many of these grand villas remain, their high ornate ceilings are still intact; their grand staircases lead up to wide open living areas with views to the rolling countryside. I used one of these lavish homes as the base for the trip. On opening the door I was hit by a blast of fresh, cool air despite temperatures in the high 80s F outside. It wasn’t manufactured air con—centuries back, builders knew how to construct these homes to be naturally cool. In the property I stayed in, beautifully tiled floors lead to an iron staircase and wide open upper stories with views across the rooftops to the rolling Sicilian countryside. Sitting in this room, you could watch the colors change as the seasons roll through. The owner, M.T, a native of Gangi, lives up north. That’s where employment prospects take many young people these days. M.T bought this home for €40,000 ($51,000) and spent €90,000 ($115,000) all in on her renovation. A couple of doors down you’ll find a larger property that was once home to a powerful duke. This place, in keeping with its royal inhabitant’s status, is three to four times as wide as M.T’s home. It’s four stories with views to the rolling countryside. It’s been lived in until recently…but still, it’s a fixer upper. It’s crying out to be restored to its former glory…or converted to six to eight luxury apartments. There’s no local appetite to take on a project like this. These days the young leave Gangi for university or work. If they stay they tend to buy a modern home outside the old town. That’s why it comes with a price tag of just $115,000. But, if even a €90,000 sticker price seems steep, how about a home for a euro? One of these properties I visited is about 800 square feet. You walk in from the narrow cobblestone streets straight into the kitchen. The home, like M.T.’s, is one room wide. Above the kitchen is a comfortable bedroom. The top floor is another bedroom suite under a pitched room. From the windows, you have those same stunning views. Basic renovation would set you back $45,000. Do it nicely, with hand-painted tiles and other artisan finishes, and figure on spending $65,000. That’s a killer deal—one quarter or less of what you could spend in a hill town in the Luberon national park in France’s Provence. A friend recently paid $340,000 (at today’s exchange rate) for a two-bedroom home of 790 square feet—which is a great deal for a home in Provence. In other, more touristy hill towns in Europe, like say, Saint-Paul de Vence in France or San Gimignano in Tuscany, you could figure on spending well into seven figures. That’s because ancient homes in historic hill towns have intrinsic value. Find one in a place that’s overlooked and out of favor, like Gangi, and you can score a bargain. I’ll be telling members of my Real Estate Trend Alert service all about this opportunity soon…as well as other fantastic deals in Europe right now. To find out more about that in-the-know group of readers…or to get the full details on this deal…sign up here today.